Living A Whole Life: I Made My Own Lotion (and I love it)! Not long ago I mentioned that I was attempting to make my own Herbal Healing Lotion. I finally got a chance to do it and I love it. It turned out a little thicker than I would personally like. I probably went a little overboard on the beeswax and would use less next time. Otherwise I love this lotion. It is very moisturizing and healing. Here are the directions for what to do. Place herbal infused oils and Beeswax over a double boiler and gently heat until the Beeswax melts. Remove from heat and add Lavender Essential Oil and Vitamin E Oil. Quickly pour into prepared tins or glass jars and allow to cool completely. 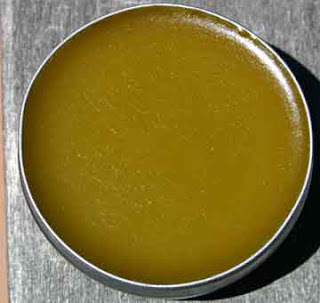 The salve will last for at least a year, and is best kept in a cool and dark area such as a cupboard or cabinet. Solar Method: Fill a glass jar 1/4 full of dried herb and then cover with Extra Virgin Olive Oil (or other oil of choice) leaving at least 1-2" of oil above the herbs to allow the herbs to swell. Place jar in a sunny window and shake once or twice per day. Allow the oil to infuse for at least 4 to 6 weeks, or until the oil takes on the color and scent of the herb. Once that oil is ready, strain using cheesecloth, and bottle into amber bottles for storage. Make sure to squeeze as much oil as possible from the herbs and cheesecloth so that you do not waste any precious oil! The infused oils may be used alone, or used within herbal preparations such as salves, massage oils, creams, lotions, or anything else you desire! Herbal Oils will keep for approximately a year if stored properly in a dark and cool place. Vitamin E Oil may also be added to prolong shelf life. This is the preferred way of making Herbal Infused Oils, however if you live in an area such as I do where the sun doesn't shine much in the winter, there is an alternate method for making these oils on the stove. Stove-top Method: Another way to infuse oils, is the double boiler or crock-pot method. Much care needs to be taken when creating herbal oils this way because you do not want to deep-fry your herbs! Place herbs in a crock-pot or double boiler, and cover with Extra Virgin Olive Oil (or other oil of choice) leaving at least an inch of oil above the herbs. Gently heat the herbs over very low heat for 1-5 hours until the oil takes on the color and scent of the herb. Some texts recommend heating the oil 48-72 hours at a controlled temperature of 100 degrees Fahrenheit. Turn off the off the heat and allow to cool. Once the oil is ready, strain using cheesecloth and bottle into amber bottles for storage. Perhaps you don't have the time or inclination to make your own lotion - some aren't as crazy as me. Here are the healing properties of some of the ingredients. Look for these when you purchase your own skin care products! Calendula - otherwise known as the common marigold is known for it's healing and pain relieving properties. St John's Wort or Hypericum perforatum is a calming herb, emollient and skin softener. It works great on dry, irritated skin, damaged hair and dry scalp. Vitamin E Oil is the most potent antioxidant vitamin. It protects the skin from cancer causing free radicals and is essential for proper utilization of oxygen in the tissues. Comfrey is a wonderful herb that encourages healing in any tissue when used either topically or internally. It's great for skin, but also beneficial when used on open wounds, sores, or burns. Lavender Oil has soothing and antiseptic properties when applied to the skin. Of course we love it's beautiful fragrance too. Beeswax, Carnauba, and Candellilla wax are all used as natural thickening agents, but each imparts it's own moisturizing and protecting barrier for the skin.